PUEBLO –A 1969 graduate of Colorado State University-Pueblo and former superintendent of both local school districts will share his insights with Colorado State University-Pueblo graduates in May. Dr. Henry Roman, a retired educator and community volunteer, will present the Commencement Address during the spring ceremony beginning at 10 a.m. on Saturday, May 3 at the Colorado State Fair Events Center. Roman has a passion for helping Pueblo become an even better place to thrive. For decades, he served the educational needs of the community through his leadership as superintendent of both school districts. Roman spent 43 years in then Pueblo School District 60, including 13 years as a student and 30 years as a teacher and administrator. Since his retirement from District 60 (Pueblo City Schools), he has led Pueblo County District 70 on an interim basis; the Hanover School District, in which he helped restore state accreditation to that small system; the Pueblo School of Arts and Sciences; Chavez-Huerta K-12 Prep Academy, and has served as a consultant to many educational entities, including BOCES (Board of Cooperative Educational Services). Roman earned a bachelor’s degree in mathematics in 1969 from then Southern Colorado State College, a master’s degree in mathematics from Louisiana State University through a National Science Foundation Grant, and a doctoral degree in education from the University of Northern Colorado. After earning his doctoral degree, he became the deputy superintendent of instruction and finally the superintendent of schools/vice president of University of Southern Colorado under the "Alliance" with the University. He held the position for eight years before retiring in 1999. During his years with the district, Roman was actively involved in the community serving as a member of Rotary 43, the Lions Club, and now with the Pueblo Fraternal Order of Eagles, Aerie 145. 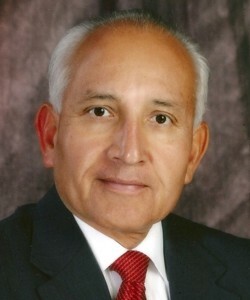 He served on numerous committees and boards including the Neighborhood Housing Services Board, the Packard Foundation Community Advisory Board, the St. Mary-Corwin Medical Center Community Board, the Pueblo Community Health Center Foundation, and the Pueblo Hispanic Education Foundation Board among others. He also serves on the CSU-Pueblo President’s Advisory Council. On May 3, guests at the commencement ceremony may arrive at 8 a.m. in order to secure seating, which is on a first-come, first-served basis. Following the commencement ceremony, the CSU-Pueblo Alumni Association will sponsor a reception for graduates and their guests.